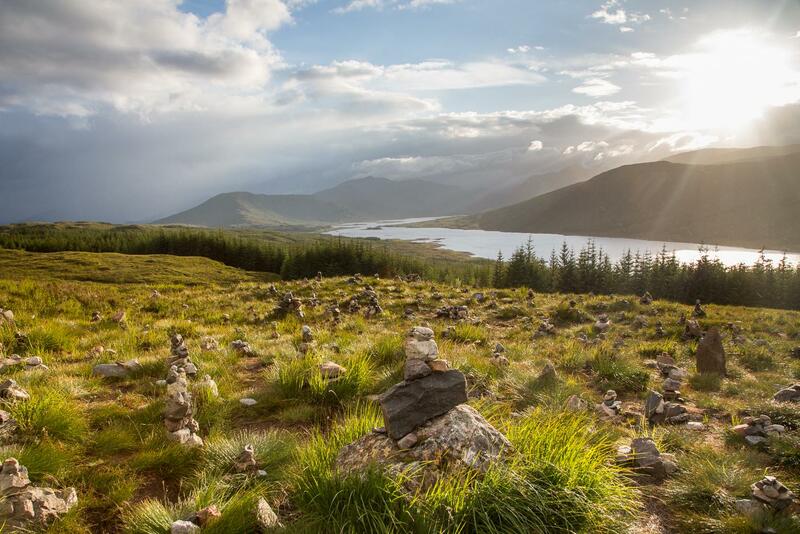 When is a pile of stones a work of art, a historical monument or an act of vandalism, and how much signage do we want in the Scottish Hills? David Lintern considers cairns, signposts, interpretation and other human interventions, both seen and unseen. Cairns are perhaps the oldest marks in our landscape, but their existence is complex – they have different forms and functions. Some designate a summit or an ancient site, waymark a route, others seem to be more about mark making or decoration. 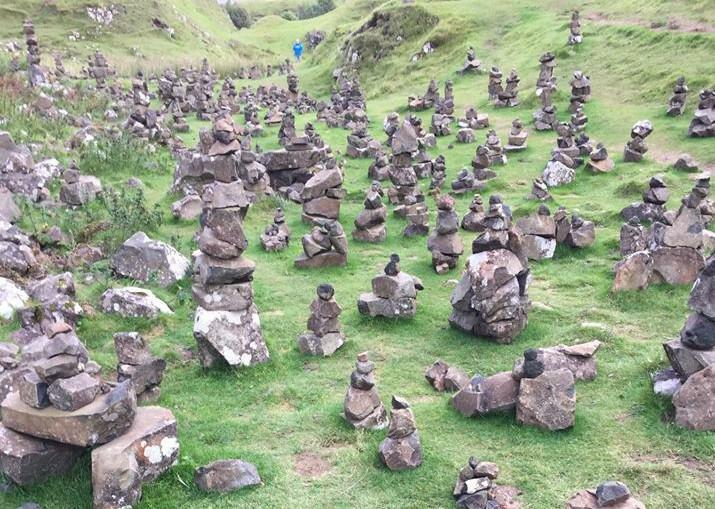 Recently, Skye locals clubbed together to remove rock stacks made by visitors in the Fairy Glen, claiming they were a risk to the health and safety of children and grazing animals, and damaged the environment. Apparently, some of the tourists got offended right back – no one likes a party pooper. But times and the tide may have changed; where previous generations of people taking direct action in this way were (often derisively) labelled as ‘cairn kickers’, this looks more like a crofting community stepping in to protect an important cultural, social and economic asset. The idea persists, however, that these structures are inappropriate in more natural places and should be removed. We shouldn’t be surprised that these rock stacks rouse passions, both for and against. Signs signify – it’s what they do. Recently, a land manager in the Lake District told me a story about cairns on Helvellyn. Stones are repeatedly carried from Helvellyn top to Helvellyn Lower Man by the visiting public. Over time this has created an enormous cairn below and a serious erosion issue on the plateau. After 25 helicopter runs (a ton of rock each) from Lower Man back up to the top, the cairn still stands on Lower Man – that’s the extent of the issue. Human-made marks in the landscape set precedent. A small cairn becomes a bigger one, one becomes several, several may eventually become several hundred. 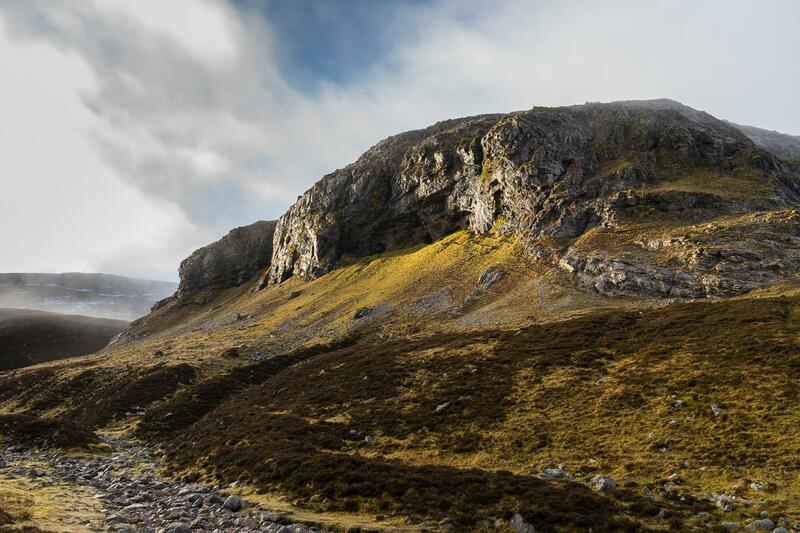 They may intend to show the way, but just as many point in the wrong direction: the John Muir Trust has to remove cairns on Ben Nevis most years because of the serious risk that misdirection toward high cliffs poses to public safety. The more decorative structures – the ones deemed unnecessary or a blight on the landscape – seem to have accrued the most media attention in recent months, but our thinking is confused on these too. I can think of places on the River Feshie where rock stacks are made by both locals and visitors; floodplains where rocks move around a lot due to natural process, but where we might prefer not to see these mini cairns, however temporary they might be. Yet some of us might also advise that the best place to have an open fire (if at all) would be rocky banks like these, as it creates less impact than a fire on soil. So are we saying fire on shingle is OK, but rock stacks aren’t? Our interventions might also have an actual affect – one apart from our subjective perception – on the riverbed environment or the mountain plateau, disturbing or harming flora and fauna. One thing leads to another – 1 or 2 stacks might be OK, but 50 or a 100 will have an impact on both the environment, and our experience of it. I’ve recently returned from a week’s trek in southern Spain, where above 1500m stone bivi’s and cairns were ubiquitous, but there was no other waymarking at all, and very few paths. Some of the cairns were unnecessary, while others were useful handrails as a means of negotiating some very complex boulder fields. Personally, I am more tolerant of rock stacks that serve a navigational function, and much less so of those that are about mark-making. I’ve kicked a few cairns of my own in the past, but you might argue that my thinking is inconsistent – I’m not making a case for the removal of ancient stone monuments or summit piles, and I like a Nepalese prayer flag as much as the next mountain geek. So cultural marking is OK sometimes but not all the time? Make your mind up, man! 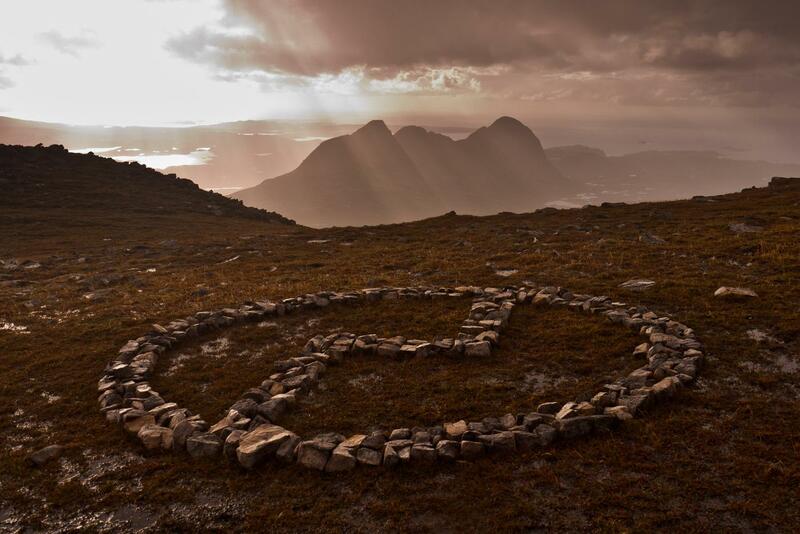 ‘Land art’ on Canisp – an appropriate tribute or well meaning vandalism? When does ‘decoration’ become cultural artefact – history to be preserved? And what about other marks in the landscape? Is ‘land art’, like the creative piece I found years ago on the slopes of Canisp, any different to those social media friendly rock stacks? 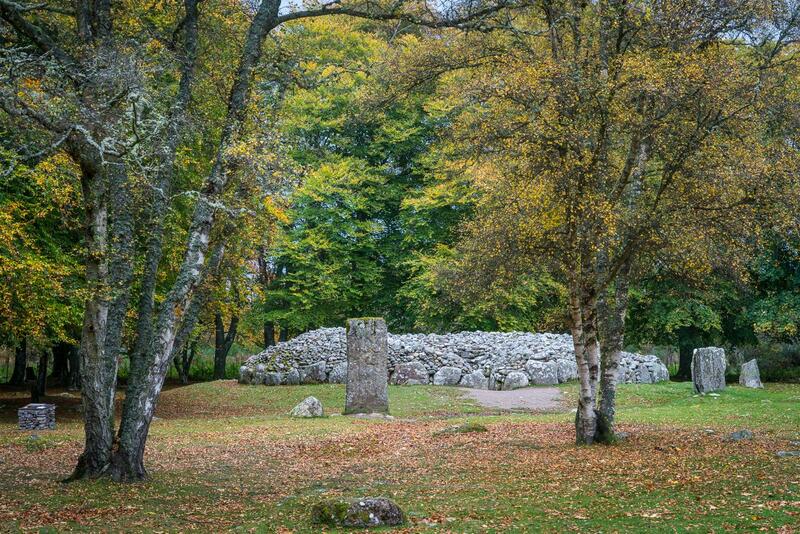 Why I am moved by the memorial cairn to Captain Maryon on Sgurr na Stri and awed by a sense of deep history when visiting the Alvie Ring Cairn, but left a bit cold by some of Andrew Goldsworthy’s more permanent additions in Dumfries and Galloway? Intention and function matter, and the mark or structure needs to be somehow in conversation or part of a story with the land around it… but my judgements are probably as subjective as yours. Personally, I think the impulse to interact with these ephemeral and elemental places is an ancient one, be it the incredible Clava Cairns near Inverness or cave paintings in Bears Ears, Utah. 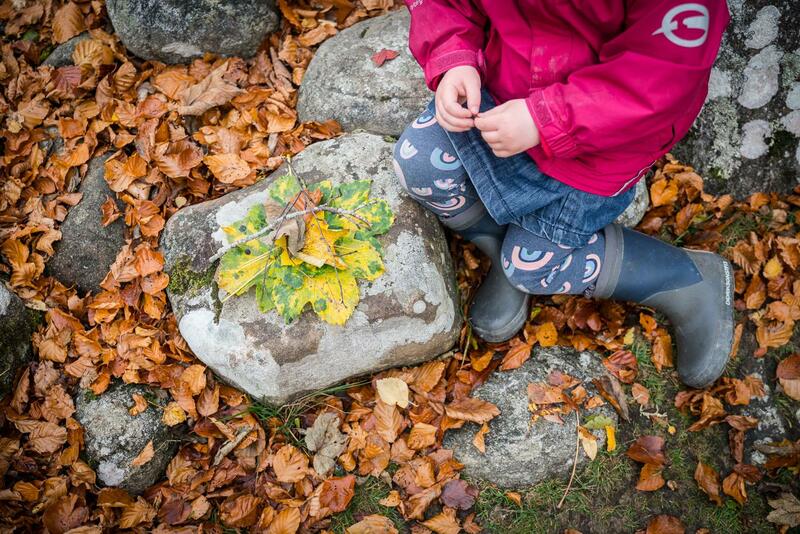 We have always wanted to scratch, build and draw, a manifestation of the to and fro between nature and culture. Does that mean anything goes? Perhaps modern land artists making temporary work (see Richard Long) might provide us modern secular mortals with an ethical steer. Make a mark – if you must – document with a photo and remove all trace (Spoiler; permanent marker not allowed!) There’s simply too many of us to absorb the effect on the natural environment otherwise. Our impact is cumulative, even if our intention – to express a connection, to re-create, or even to say ‘I was here’ – might be understandable. Cairns aren’t the only type of sign. 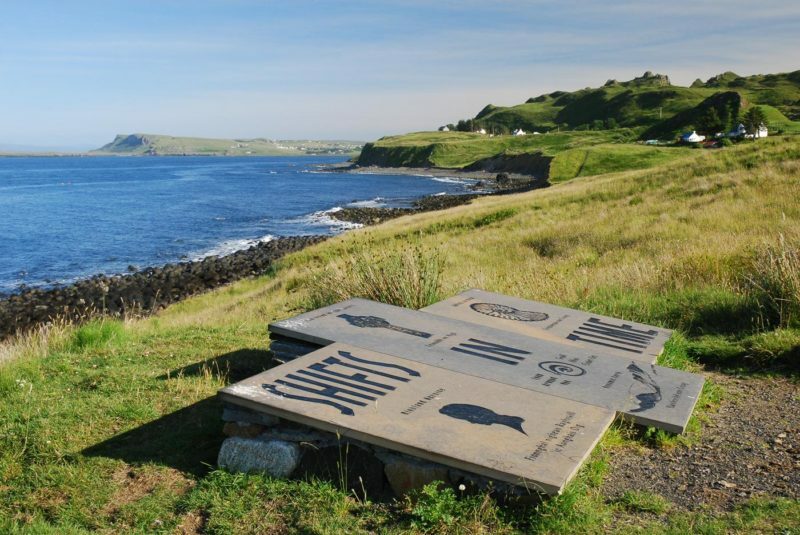 There are both sign’posts’ and interpretation panels – the former showing the way to or from, and the latter seeking to explain the why’s and how’s of where we are. I can think of good and bad examples of both, and as you’ll have gathered by now, personally I reckon it’s all a matter of context. Waymarking signage is even more vested and political… if that’s possible. The relatively new Affric-Kintail Way cuts through some remote country and is signposted in a way that some find intrusive. I’m told there’s even a campaign to introduce signposts on the Cape Wrath Trail. But if local communities support the waymarking of trails as a means of encouraging more sustainable tourism, should experienced hillgoers object out of principle because it impinges on our ‘wild’ experience? That’s assuming waymarking actually functions to improve access and safety. There’s also a case that signage creates a false sense of security, increasing the risk of inexperienced folk wandering into remote places that they aren’t fully prepared for. These are both valid positions to explore. I’ll share another anecdote, which helped me get my head around this. Speaking to someone from Scottish Natural Heritage on the hill earlier in the summer, their personal view was that different trails offer different levels or types of experience. 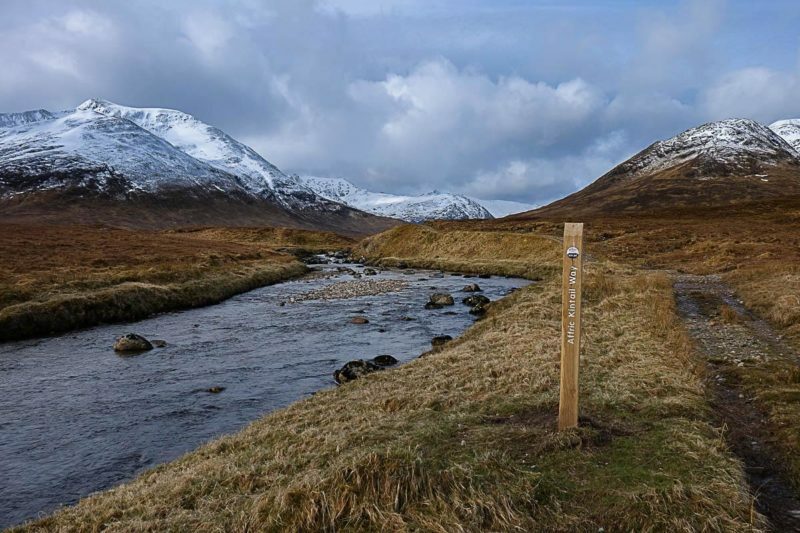 The West Highland Way warrants signposts because it caters for beginners and those new to Scotland – often from abroad. Other outdoor users want something more rugged and challenging from their long-distance walking. Both are just fine and can co-exist. Of course – we should try to cater for a variety of people. Again, it’s about context. I can think of some Scotways signs that denote core footpaths, drove roads or other historic rights of way that I am very pleased to see – because public awareness can help keep the route open and used, and because the threats to our wide-open spaces are now such that if they weren’t marked and used, a landowner or energy corporation would probably build on it. (Sadly, I’m not exaggerating – see my previous article.) On the other hand, I’ve had countless conversations with European and American visitors who love Scotland because it is mostly free from the hill furniture that adorns parts of the Alps and the US. My overall default position is something like this: I prefer no signs to some, but I’d rather the discrete red/white stripes of a Grande Randonnèe to a full-on ‘signpost’. Interpretation and waymarking signage should be kept to car parks and entry points only. I believe that the relative lack of built infrastructure in the Scottish Highlands is something to be cherished… and something that brings (spending!) visitors back again and again. It’s something of a USP for us, and preserves some of the challenges of outdoor travel in our otherwise small country. 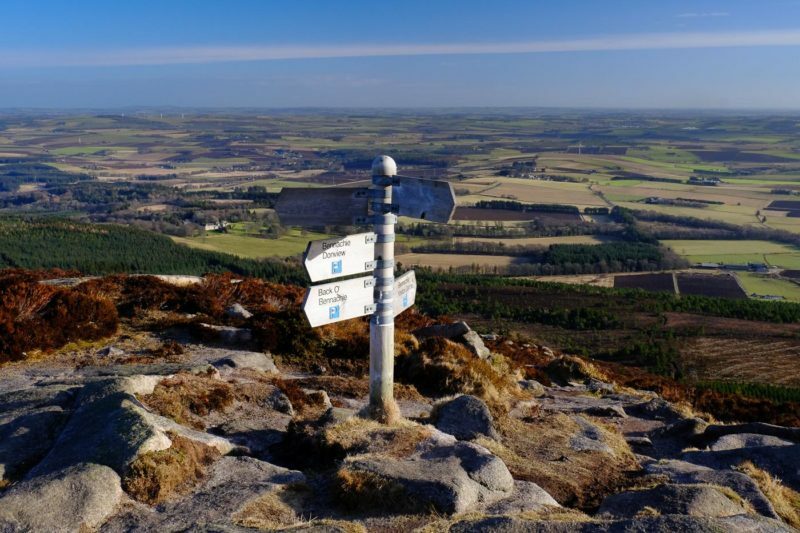 Sure, Scottish ‘ruggedness’ and ‘remoteness’ may be relative and in the eyes of the beholder, but these perceptions are shared by enough people to make them culturally significant – both within and outside the rural communities these trails pass through. I think this is something that community consultants, planners and politicians sometimes lose sight of when selling the dream of shiny new trail infrastructure to local communities. In short, one size needn’t fit all, and we should leave some routes – perhaps routes like the Cape Wrath Trail – well alone. Signs aren’t always physical –there’s now the digital trace to think about as well. 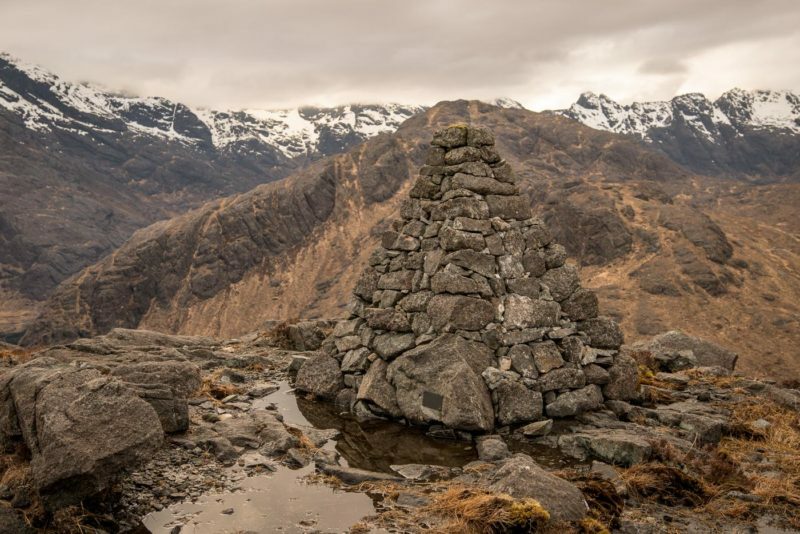 Smartphone based trail and interpretation apps have started to replace some built infrastructure but often only work where there is a data connection – less useful in the Kintail hills, then. In those Spanish mountains recently, I was glad of a GPX trace on a couple of occasions as a fallback in dire weather, but otherwise my digital mapping was switched off. I don’t go into the mountains to stare at a screen – I can do that at home or at work. On the other hand, imagine the possibilities of camera sensitive software in the near future: virtual reality could help illustrate life before the clearances in Glen Banchor, or head back further in time to illustrate volcanic activity in Glen Nevis, the creation of the parallel roads in Glen Roy or the landslip on the Quirang in Skye. I’m not sure I need to see digital dinosaurs roaming Loch Insh, but my kids would probably love it… and new means of interpretation in the landscape would have the advantage of not leaving physical marks. Some digital scars are starting to show through, though. I’m increasingly aware of the problem of honey-potting caused by our unquestioning use of social media. 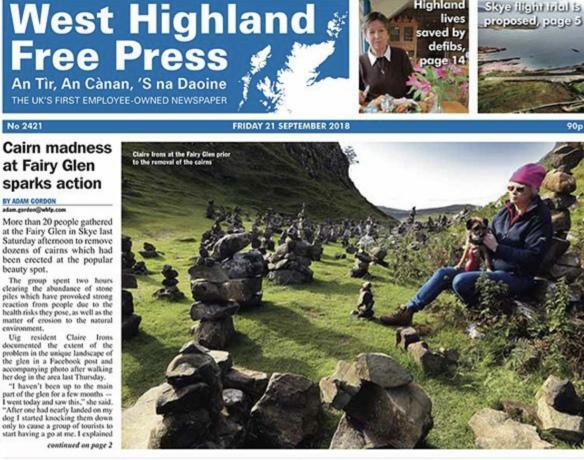 It certainly seems to have fuelled the recent popularity of rock stacking in the fairy glen and elsewhere. Tourism is an industry. Adding a location or hashtag to our Facebook or Instagram posts can lead others to seek and destroy fragile and remote places on an industrial scale. Most of this happens unconsciously, but in trading for ‘likes’ so many of us are complicit in that cumulative impact. If sharing is no longer caring, then resisting it’s lure also preserves the slow adventure of finding out for oneself. Time and effort spent discovering and exploring new places on our own terms means the rewards are greater – surely, we shouldn’t deny others that satisfaction? We might even create a more interesting media less reliant on listicles in the process! I’m aware of the ironies of warning about digital infrastructure on Walkhighlands – a website with thousands of routes, photos and GPX mapping – but again, I’d argue it’s about context. Thankfully my hosts also provide interpretation on the history and wildlife of places, as well as how to get to them. Twitter, Facebook and Instagram allow that wider context to be stripped out of an image, which I think can lead to unsustainable tourism – an influx of people without the necessary infrastructure, knowledge and experience to support their visit.